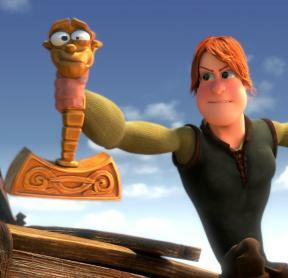 It’s no surprice that Vikings and Norse mythology are the themes of Legends of Valhalla: Thor, the first animated feature film made on Iceland. In a small nation, it is relatively easy to be the first with something. Iceland’s first horror film came in 2009, and their first animated feature (this film) was released in 2012, not surprisingly on the thankful theme of Vikings and their beliefs. The 3D CGI adventure blends action, mythology, religion, magic, superstition and the forces of the gods in a rather traditional way, but it’s always nice to see homegrown stories like this. Thor was the Norse god representing thunder, lightning, storms, strength, the protection of mankind, and fertility. In the film, Thor is actually a teen blacksmith who lives with his widowed mother in a small Viking village. According to what he has been told, he is the son of Odin, the king of the Norse gods, residing in Valhalla, the after-life feast hall. Sure enough, Odin is there but is not keen on recognising or helping is son. But things change when an army of giants, the stupid but strong Jotuns, invade the village and take the inhabitants to Hel, the queen of the Norse underworld. So, the 3D CG craze has reached Iceland (this is mostly an Icelandic film – some funding and animated came from Ireland and Germany), a country in the Nordic region with a quarter the number of inhabitants of a medium sized European city. That does not necessarily prevent them from making good movies, but it also explains why they would invest in a fantasy film for children, when trying their skills in animated CGI. Children films can be quite profitable, but they also occasionally suffer from poor characters or basic animation in favour of cheap solutions such as talking animals, “because that is what kids like”. In this film, there are no talking animals (unless you count the trolls as animals), but there is a talking hammer, Crusher, which plays an essential role. Can not fantasy films for young viewers be made without talking animals or talking objects? Sure they can, and it isn’t exactly a creative choice anymore to give life to objects just to make it fun for the young ones. On the action side, stunts, fights and jumps are plentiful, and of course it is cartoonish (this is not Beowulf), which to some may be annoying but again, this is a child’s film and without impossible events it would have been a boring movie. I watched the 2D version and there are not too many moments where events are designed to look spectacular in 3D and comes out flat in 2D. 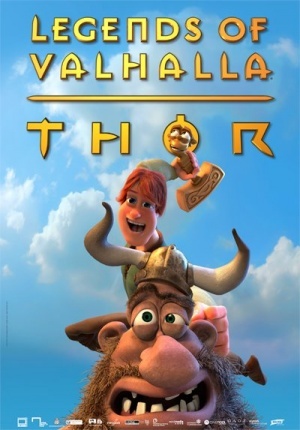 Legends of Valhalla: Thor (in some countries known as Thor: Legend of the Magical Hammer) offers some fun and tough characters, nice animation and a story with potential, but the comedy is too slapstick-y cheap. It may work on the kids the film is intended for (I would guess 7 to 12 year olds) but for genre fans and general audiences there is little in the story or in the jokes that keep the movie interesting for long periods of time. Vikings and their gods are always interesting as such, and in fact that is what saves the film; if nothing else, you get a little insight into Norse mythology, although the film isn’t a factual history lesson (those Valhalla houses, for example, look more Medieval than Viking). The most innovative part about the film is how sacrifices to the gods work, a little side-story that, considering it is the only surprise here, says much about the rest of the film. As a genre entry, even taking the intended audience in mind, Legends of Valhalla: Thor is nothing spectacular, innovative or cross-reaching. What it is though, is a run-of-the-mill fantasy adventure, set in a time and in places that in themselves are attractive enough to keep children entertained. Legends of Valhalla: Thor lands on its feet, but earns no points for elegance. ← Norwegian duo to hunt ghosts?